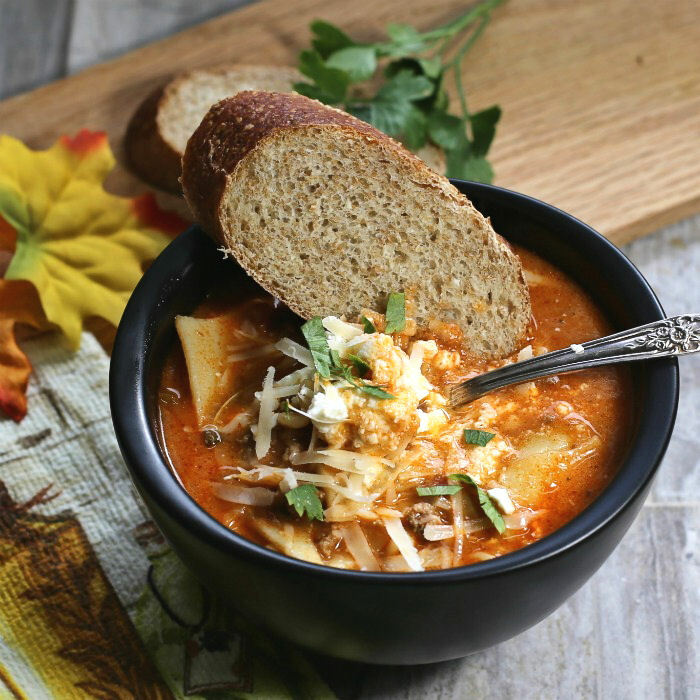 This one pot lasagna soup recipe is a meal in a bowl brimming over with bite sized lasagna noodles, and rich marinara sauce smothered with cheesy goodness. 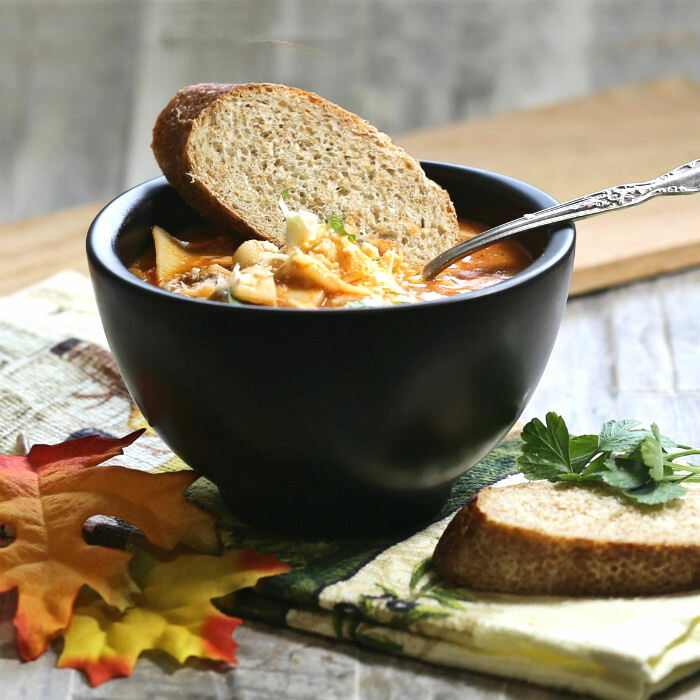 Onions, garlic and fresh Italian herbs give this mouth watering soup a delicious aroma and taste. Once you have had this soup, you may never ask for normal lasagna again! Lasagna is a traditional Italian favorite that uses long, curly noodles that hold up well to layers of a rich tomato sauce that is flavored with Italian spices. It takes hours to prepare and has to sit before you can cut it so that it holds up well. Making a normal lasagna means browning the meat, precooking the noodles, and preparing all those layers of cheese and meat. And that is before it has to go into the oven to cook for close to an hour. This recipe is a quicker version of the same authentic flavors, easily made in one pot that uses smaller bite sized pieces of the same noodles. The recipe is made into a soup, but gives you all the flavors and tastes of the original. Fall is here and October is right around the corner! There’s a noticeable chill in the air, the leaves are starting to change colors and my mind turns to thoughts of soup. My family loves soup all year long, but I adore it this time of the year. There is nothing like curling up to a big bowl of flavors that deliver such comfort food goodness in each spoonful. What is a one pot recipe? When all of your ingredients can be prepared, cooked and served in the same pot or pan, you have the makings of an easy one pot meal. Cooking this way goes a long way towards making clean up easy. Normally, one pot dishes have a starch, protein and vegetables all rolled into one super tasty dish making for a balanced meal. 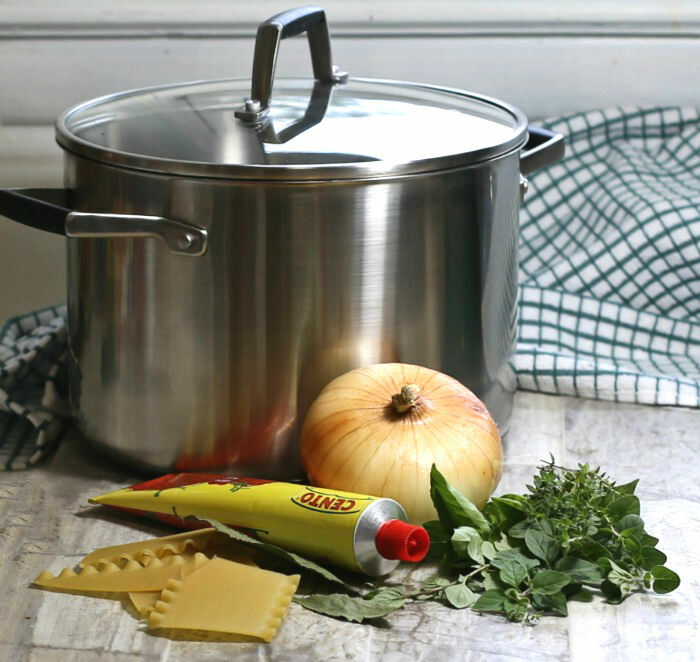 One pot recipes can be made in all sorts of containers. Dutch ovens are a favorite of mine for soups like this, but sheet pans and stove top to oven casserole dishes also work for these easy to prepare meals. This Italian lasagna soup may look as though the recipe is really involved, but it’s actually a snap to put it together. Each step of the soup making process is like a layer of the traditional lasagna casserole – just brimming with authentic flavor and so delicious! Most lasagna recipes are meat based. I chose a lean ground beef as well as some mild Italian sausage to give the taste a bit of a kick. Onions, garlic and fresh herbs will round out the flavors for an Italian taste. You can’t have a good lasagna without some tomatoes and noodles! 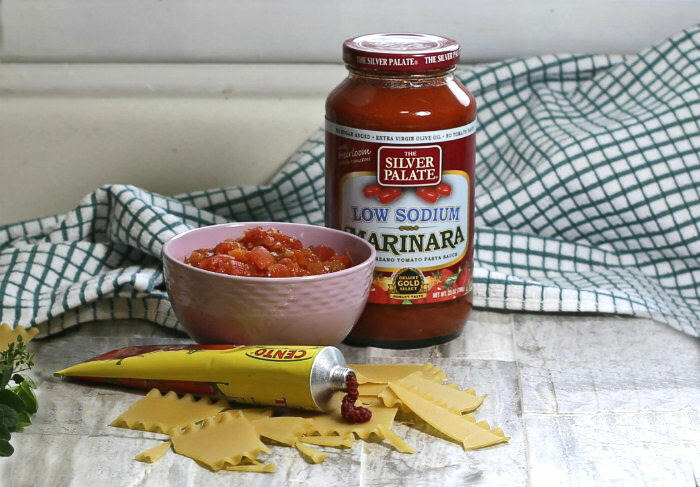 I chose a good quality bottled marinara sauce, some tomato paste for richness and thickness and canned tomatoes for freshness. The diced tomatoes that I used were mixed with some chili peppers. This gives my soup a bite of a spicy kick, which my husband loves. You can use plain tomatoes if you like a milder taste. This soup has bite sized pieces of lasagna noodles floating in the rich tomato broth. This is a great use for those that get broken in a normal package! Just save them all till you have enough and you won’t need to break any of the whole ones! 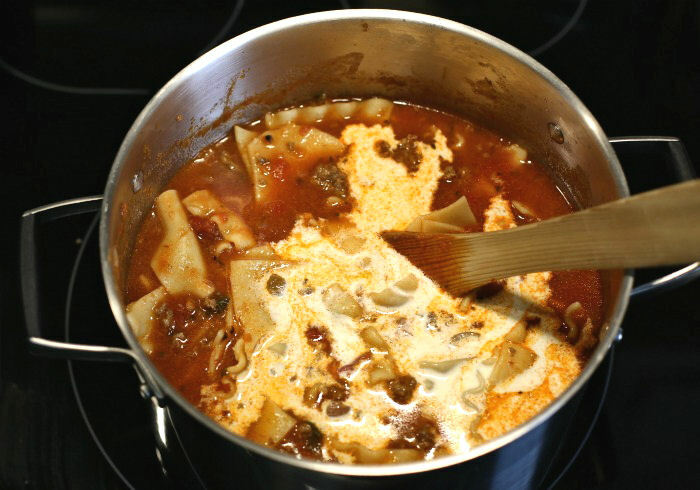 How to make lasagna soup! Start by heating a large Dutch oven over medium heat. I sprayed my pan with a cooking spray so that the meat would not stick to it. 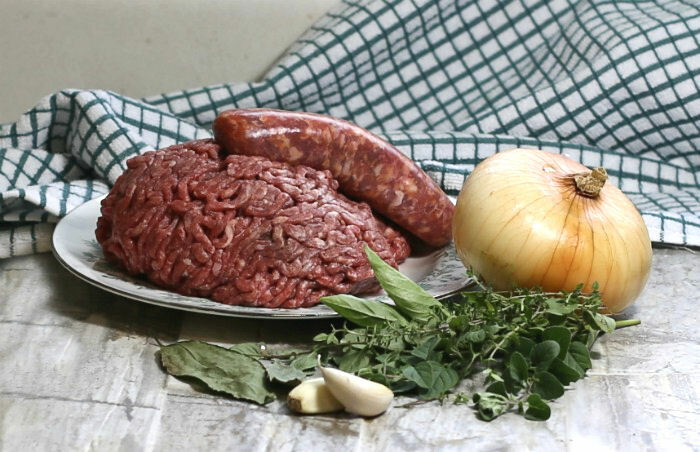 Remove the casing for the Italian sausage and cook it with the ground been and onions, breaking up the meat as you cook. Stir occasionally until the meat is nicely browned, then stir in the garlic and cook for another 30 seconds until it is cooked. If your beef has a lot of fat, you may want to drain it now. 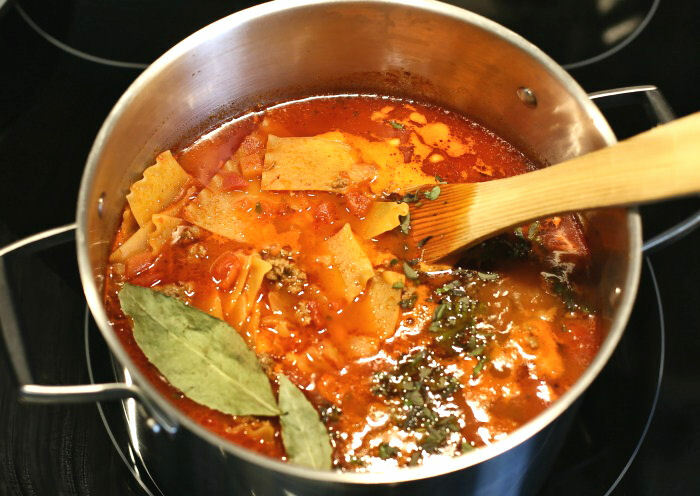 This will save calories and fat in your finished lasagna soup recipe. Add the marinara sauce, half of the chicken broth along with the crushed tomatoes and tomato paste. This will make a delicious and flavorful base to the soup. Now is also the time to stir in the sugar, fresh herbs and bay leaf and the lasagna noodles and bring the mixture to a boil. Reduce the heat and simmer gently for about 20-30 minutes then season with salt and pepper to taste. Remove the bay leaf and stir in the rest of the chicken broth and the heavy cream. This will help to thicken the soup slightly and give it a creamy finish. Part of the appeal of this hearty lasagna soup is the flavor that comes from the cheeses that a normal lasagna recipes has between the noodles. However, I wanted to keep the calories as low as possible, so I am using the cheeses as a garnish for the finished soup. I used three types of cheese: fresh Parmesan and mozzarella as well as part skim ricotta. The three combine to give the soup a deliciously cheesy texture and taste that can’t be beat. Serve the soup in individual bowls and garnish it with fresh gratings of silky Mozzarella and sharp tasting Parmesan cheese. 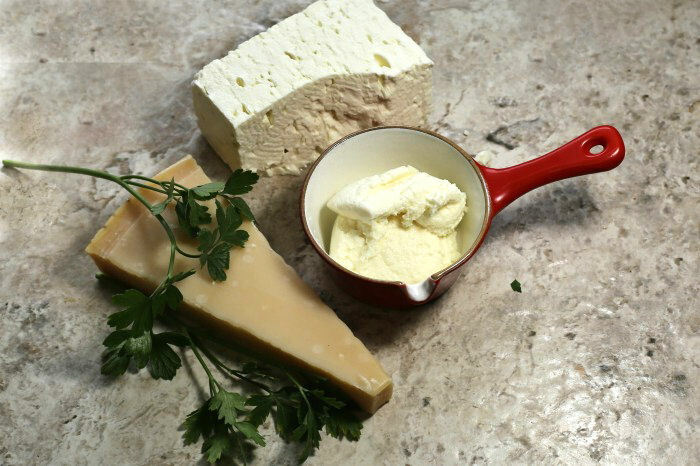 Spoon over a dollop of ricotta cheese and garnish with fresh chopped parsley. Every spoonful of this amazing cheesy lasagna soup is just brimming over the tastes of Italy. The aromatic marinara base is flavored with fresh herbs and the delicious taste of both onions and garlic. As you dig into the soup, the small sized pieces of lasagna noodles combine with the cheesy goodness of the three cheeses to give you the traditional taste that you expect from lasagna: rich, decadent and hearty. 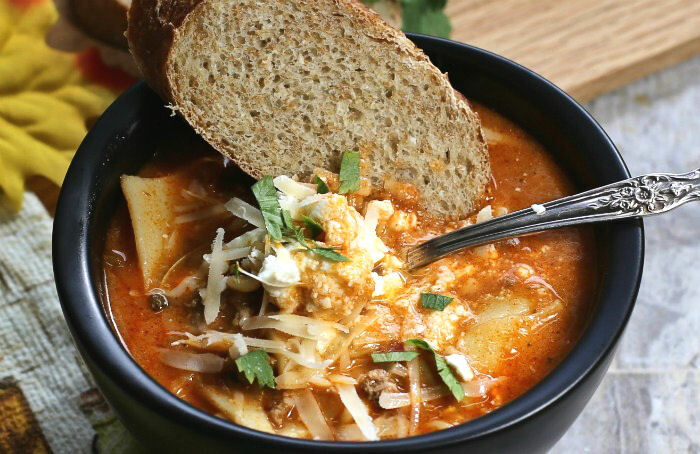 Serve this sausage and beef lasagna soup with some crusty bread to soak up every last drop of the delicious broth. Are you in the mood for the feel of a rich and decadent lasagna but don’t have the time or patience to assemble one? 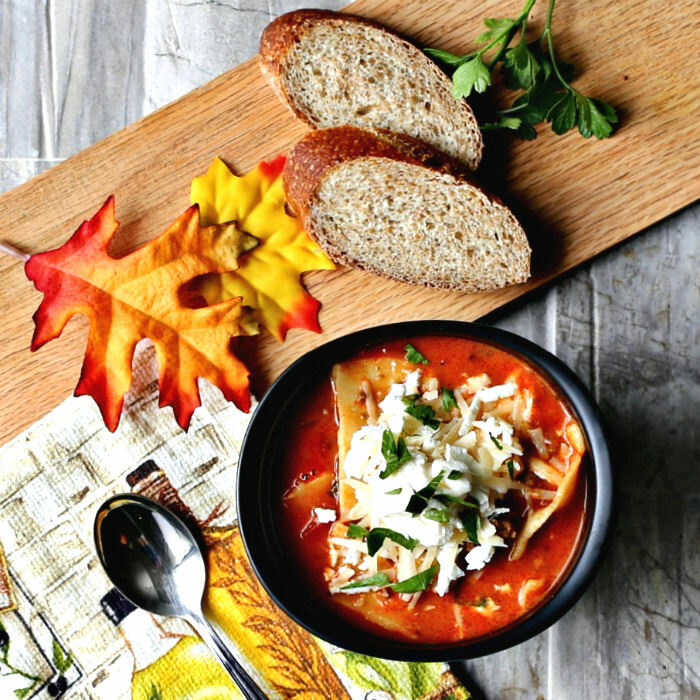 Try this One Pot Lasagna Soup with ricotta cheese. It is ready in under an hour and my family says that it tastes fabulous! The recipe for this soup serves 8 very generously. Each serving has 426 calories and is high in fiber and protein. 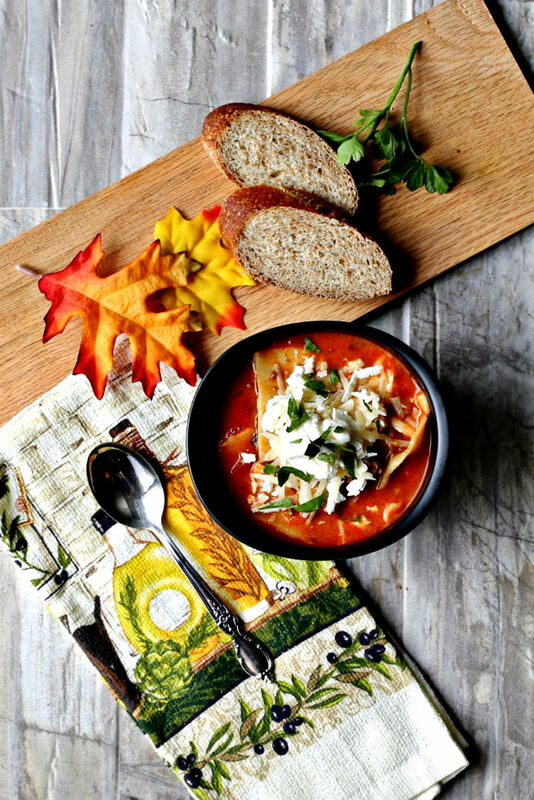 If you are looking for a reminder of this hearty lasagna soup recipe, just pin this image to one of your Pinterest cooking boards so that you can easily find it later. Heat a large Dutch oven over medium high heat and spray with cooking spray. 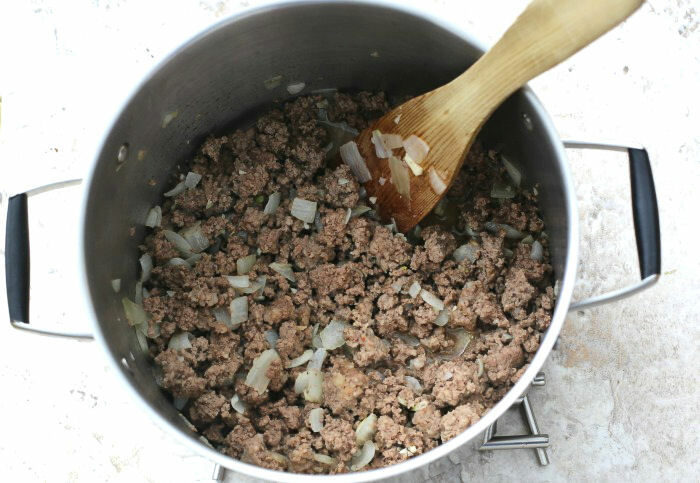 Add the ground beef, Italian sausage and onion and cook, stirring occasionally until the meat has browned. Stir in the garlic and saute for 30 seconds more. Drain off any excess fat. Add the marinara Sauce, 4 cups chicken broth, the crushed tomatoes, tomato paste, sugar, fresh herbs, bay leaf and lasagna noodles. Bring the mixture to a boil then reduce the heat , and simmer until the lasagna noodles are tender, stirring occasionally (approximately 20-30 minutes). Season to taste with salt and pepper. Discard bay leaf and stir in the heavy cream and 4 cups of chicken broth. Serve the soup in individual bowls and garnish with the Mozzarella and Parmesan cheese. Add a dollop of ricotta cheese and garnish with fresh chopped parsley. 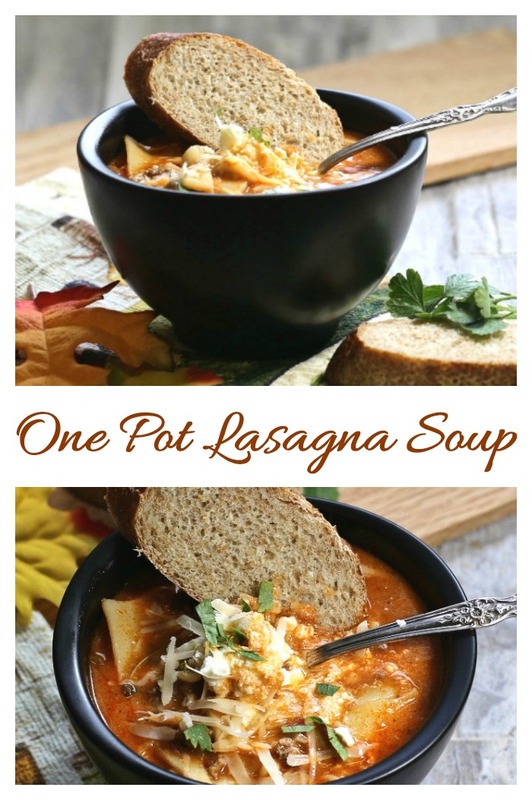 This soup looks amazing and I love the one pot meals for sure! !